Where to take the family for an inexpensive holiday in the autumn and winter is a quizzical thought for many. The largely underrated option of camping is often forgotten, regardless of the priceless memories the magic of camping can create. The glistening sun through your tent in the morning, the chirping of birds at day break, the campfires under the starlight and the secrets of the woods make for a truly enchanting place to have family fun. Unfortunately, for many lovers of the great outdoors, the end of August means it’s time to pack up the BBQ and wait until the next summer season begins. But if you love to get away from the strains of modern life in any season or are simply a nature enthusiast, Camping in the Forest has five sites open all year round to help fulfil your desire. Their beautiful campsites allow campers to be completely immersed in the forest – whatever the weather. For those who want to get closer to nature but without the hassle of using a tent, then Bracelands has ideal year-round options. With both pitches and camping pods on site, all types of campers are conveniently catered for. Located in the Forest of Dean, this campsite is surrounded by miles of walking and cycling routes on offer as well as the many local attractions, including the River Wye, Monmouth town, and the famous Symonds Yat Rock. The exquisite panoramic views and rich array of oak, beech and pine trees, this spacious 520 pitch campsite is perfect for the budding camper. In the vibrant New Forest, Camping in the Forest's Setthorns site is great for those wanting a raw holiday experience. Whilst camping in this tranquil site, get closer to wildlife than ever before by witnessing the beauty of free roaming ponies and deer as well as rare, wild birds that can be spotted in their natural habitats. With no showers or toilet facilities on site, come prepared to be at one with nature. Should you want a change, however, the local village of Sway and Brockenhurst close by is the best place to take in the many attractions and shops. 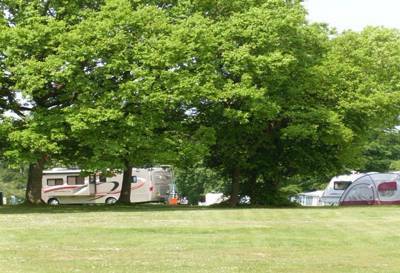 Postern Hill campsite can be found in the stunning location of Savernake Forest in Wiltshire. It offers the perfect place for a ‘get away from it all’ holiday throughout the year. Ideal for all campers and families of all sizes with beautiful pitches surrounded by oak trees and bushes, all the family can explore the wilderness. It's just a short stroll away from an array of shops and supermarkets, so everything you need is at hand, including the picturesque market town of Marlborough. Spend an evening indulging in the pubs and restaurants it has to offer so there’s no better a place to take the kids this autumn half term! Glenmore campsite is a spectacular site in the stunning Cairngorms of Scotland. With access to the beaches of Loch Morlich, there’s nowhere your family would rather spend time whilst taking in the exquisite views of the Scottish Highlands. Situated in the Cairngorms National Park, the site is a mecca for all things outdoors with the UK’s finest slopes just outside, it’s an ideal location for sports enthusiasts throughout the winter months. Or if you’re in search for a more relaxing location, then this Glenmore site is ideal. The flawless scenery and many trails available from the site will give you the perfect opportunity to engage with the rich wildlife Scotland has to offer. If you want to be in the heart of the mountains and the tranquillity of the country then the Beddgelert campsite, in Snowdonia, is for you. Open all year, you can enjoy the National Park come rain or shine. Indulge in the luxuriant greenery of Wales, finding what wildlife the countryside has to offer, including different species of otter and trout in the Colwyn River. The train station on site allows campers to venture onto the Welsh Highland Railway and take on some of the many cycling and walking routes nearby to boost your family’s adventure.